I wrote a post a couple of months ago about a bronze axe head. 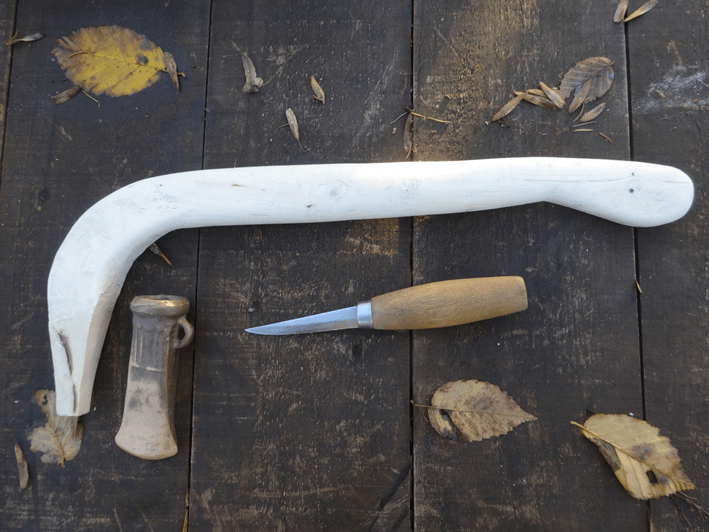 Ho Kyung brought it along to our Axe Workshop back in November. 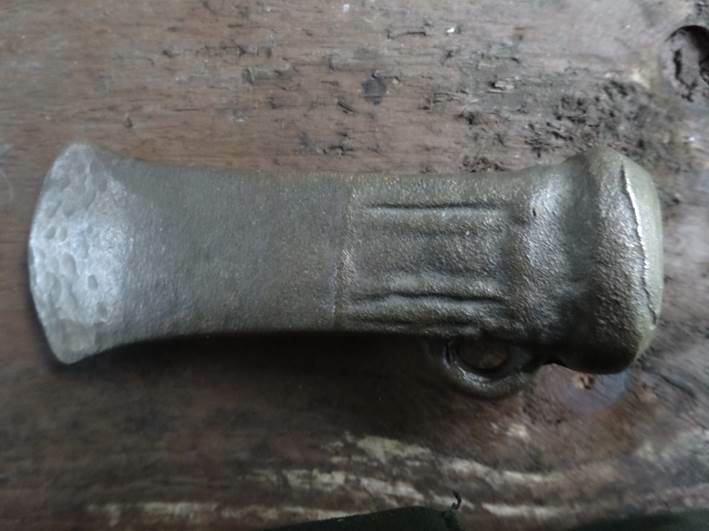 Well it seems I was wrong, he didn’t forget it; his girlfriend Julie, also a friend of mine from tai chi, is an archaeologist and has asked if I’ll make a handle for it. I’ve never made a bronze age axe handle before, so I did a bit of research on the internet. It seems that the socket axe was a fairly advanced design and used about 3,000 years ago. My first, and on going, concern is that the handle goes into the end of the axe instead of through an eye; it begs the question “How will it stay in place?”. You can see a ring on the underside of the axe head in the photo below, which is thought to have been used to tie the head to the handle. I don’t think we can know what was used for certain, maybe animal ligaments, thin strips of leather or natural cordage. At the moment I’m thinking of using leather and then shrinking it. Pretty closely following was “What was it used for?”. The bit of the axe is small, about 40mm, and doesn’t seem particularly practical, but apparently the wooden structures at Seahenge were worked with bronze axes. Maybe the purpose will become clearer once the axe is complete. The photos I’ve seen on the internet look as if the handle is made by using a branch with a limb at right angles. 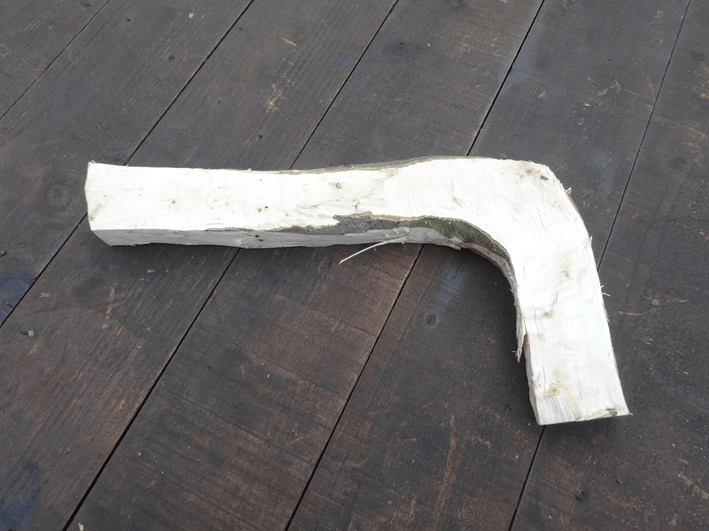 It seems to me that this approach means the joint has an inherent weakness and that you’d get a stronger handle if you used a piece of wood with a natural right angle. But where to find such a piece? Often new stems from a coppice stool will grow outwards initially before going up, but I didn’t want to use chestnut or hazel. We have some really gnarly hornbeam in our woodland, so I went for a look with the intention of finding a right angled hornbeam! As chance would have it, I came across a mature beech with a stem growing near the base with a 90° angle. 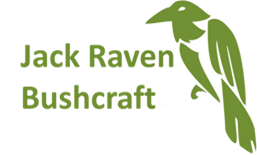 I’ve only used beech for spoons, spatulas etc. in the past, and I understand it can be a brittle wood once seasoned, so it’ll be interesting to see how it works out! 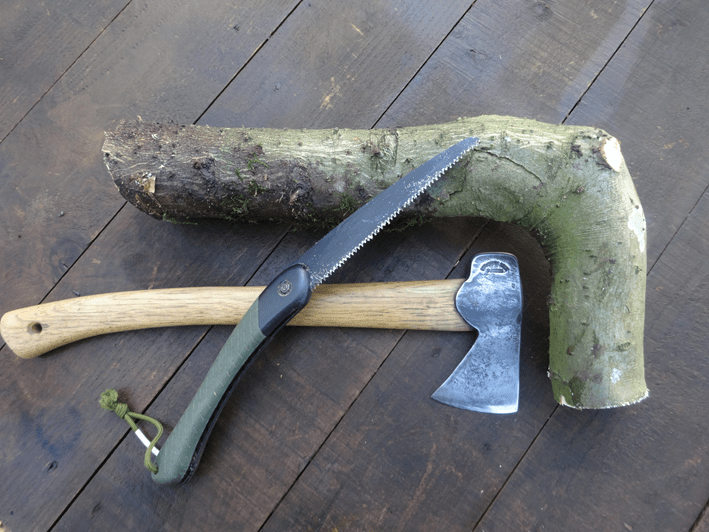 I decided to use my normal woodland tools as opposed to period tools, but as I want to keep things simple I’m only using my axe and knife (and a folding saw to cut the stem initially). I used my axe to square off the sides so I could gauge a middle line. 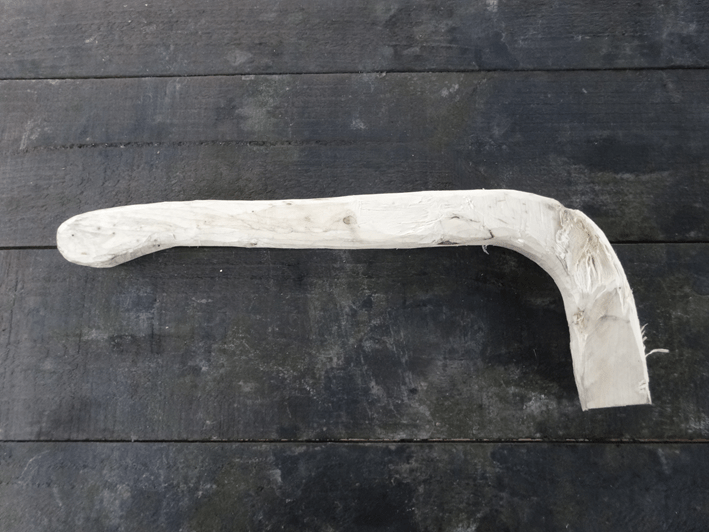 And from there I roughed out an axe handle sort of shape. The photos I’ve seen look as if the handles are round. I don’t know if this is because they actually are round or it’s just unclear in the photos, but regardless I’ve decided to make the handle asymmetrical to give a firmer grip in the hand. The outside edge of the handle and the curve by and large follows the outside edge of the original stem and I’m hoping this will give some strength to the handle. In it’s current state, the handle is also quite straight (although slightly wider at the top), I might leave it that way or I might introduce a slight curve! The next step will be to carve the end so the axe head will slide on snugly! I’ll add more photos as I progress. I’ve done some more work on the handle today. I’ve taken some of the bulk off and left it so that it’s a little wider than the handle on my small hunters axe. I’ve also rounded off all the edges so that it fits in the hand comfortably. I’ve started the taper that will eventually fit into the axe head, but left it bigger to allow for any shrinking as it dries out. I used my carving knife to do most of the work today. It’s in the airing cupboard now, where it’ll stay for the next month to 6 weeks. I’ve also put a bit of an edge on the axe head. It was incredibly blunt so I’ve used a file to at least get it to slice through butter! As time permits I’ll work on it, although I think I’ll finish the sharpening once it’s attached to the handle. I’m not sure if I’m happy with the overall shape; I’ll take another look when it’s dried out and see how I feel! Thanks for reading. I’m making it up as I go, so I’m looking forward to seeing how it turns out as well!